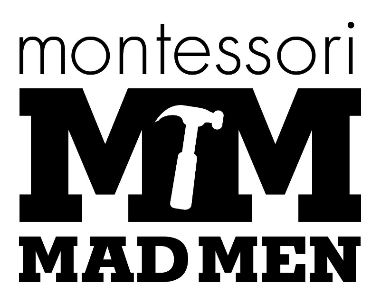 The Montessori Madmen are a group of dads across the country who are uniting to help advocate for Montessori methodology. They have written and published books and videos as well as designed apparel and billboards. They have started a letter-writing campaign, a resources list, and various other useful tools to help increase Montessori awareness. Most recognizably, Trevor Eissler (author and creator of the Montessori Madness book and video) is one of the leading madmen. Just this week, their efforts have included flying a large banner over Manhattan in an effort to attract Mayor Bill de Blasio's attention. They are hoping to convince de Blasio to incorporate the Montessori teaching philosophy into the mayor's universal pre-k plan. They are certainly an interesting group to watch as they gain national momentum. Some of our MSBG dads (or moms because they do involve women too) might be interested in their efforts; more information can be found at their website: www.montessorimadmen.com. To ensure accuracy of all our information and to best prepare plans for Fall, it's important that we have your registration forms as soon as possbile. Thank you! 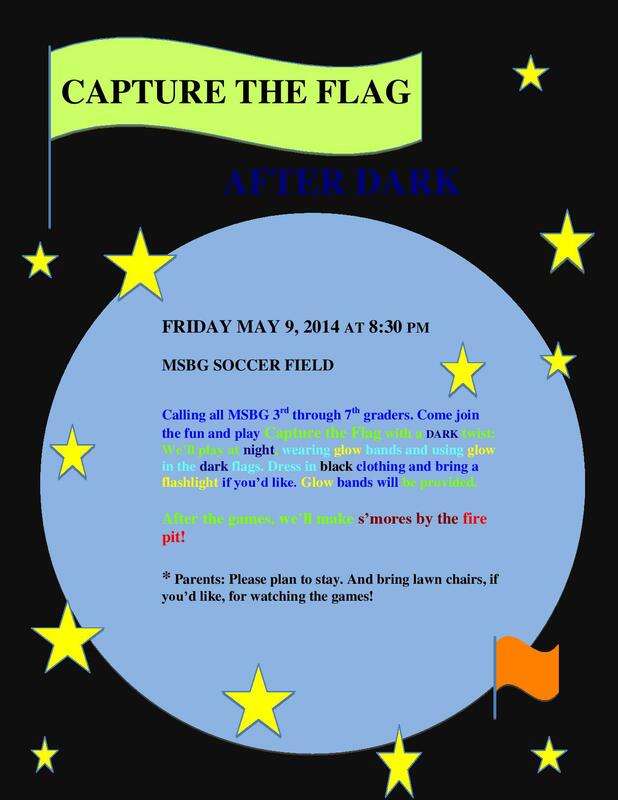 Calling all MSBG 3rd through 7th graders. Come join the fun and play Capture the Flag with a dark twist: We’ll play at night, wearing glow bands and using glow in the dark flags. Dress in black clothing and bring a flashlight if you’d like. Glow bands will be provided. After the games, we’ll make s’mores by the fire pit! * Parents: Please plan to stay. And bring lawn chairs, if you’d like, for watching the games! We are currently seeking recommendations for potential new members of our MSBG Board of Directors. Parents and friends of MSBG are very helpful in reaching out to potential volunteers so we are seeking your recommendations. Generally we are looking for individuals who are involved in the community or who have experience with nonprofits. Mostly we want individuals who will be passionate about MSBG! Please let us know of any individuals in the Bowling Green area who you would recommend. They do not have to be directly connected to MSBG. If you have any questions, please contact the school office. Click HERE for the printable form. Click HERE for the online submission form. 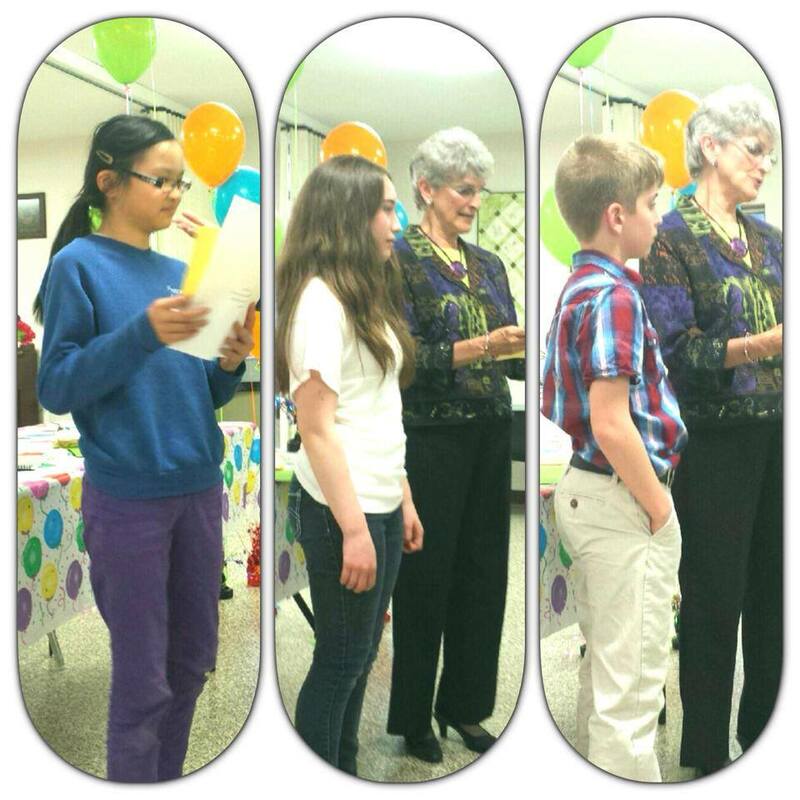 Congrats to our 1st place winners: Guo Wells-Jensen (5th grade poetry), Alexa Whyte (7th grade poetry) and Zach Cesarini (4th grade poetry). Special thanks to our library committee (Meg Vostal, Erin Hachtel, Jason Wells-Jensen, and Ruth Schroeder) who worked diligently this semester identifying the needs and resolving issues with our school library. We are currently seeking a 2014-15 librarian ($500 stipend). The position would be approximately 10+ hours/week and would involve general support of the library as well as media support for the classrooms. 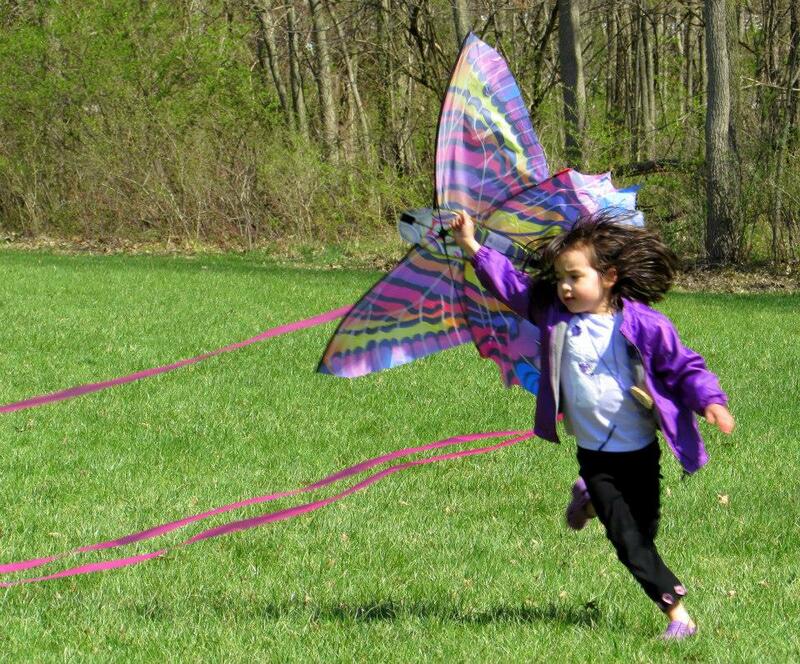 If you are interested in serving in this way, please drop a note to office@montessorischoolbg.org. 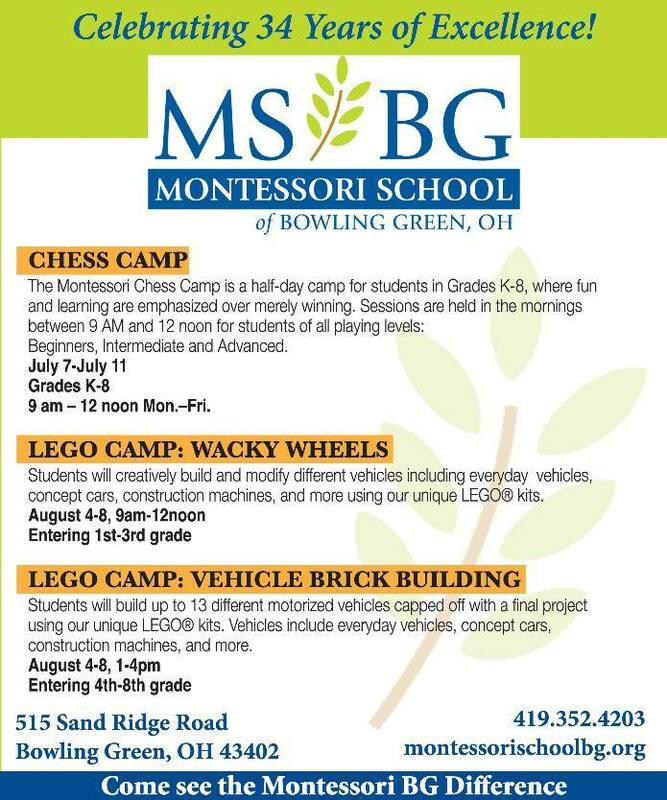 MSBG offers a few summer camps to engage learning. 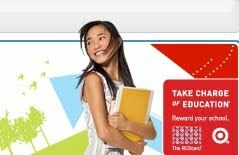 Individual learning opportunities and playdates are also offered and more information will be shared in the upcoming weeks. The Lego camp registration forms are here! 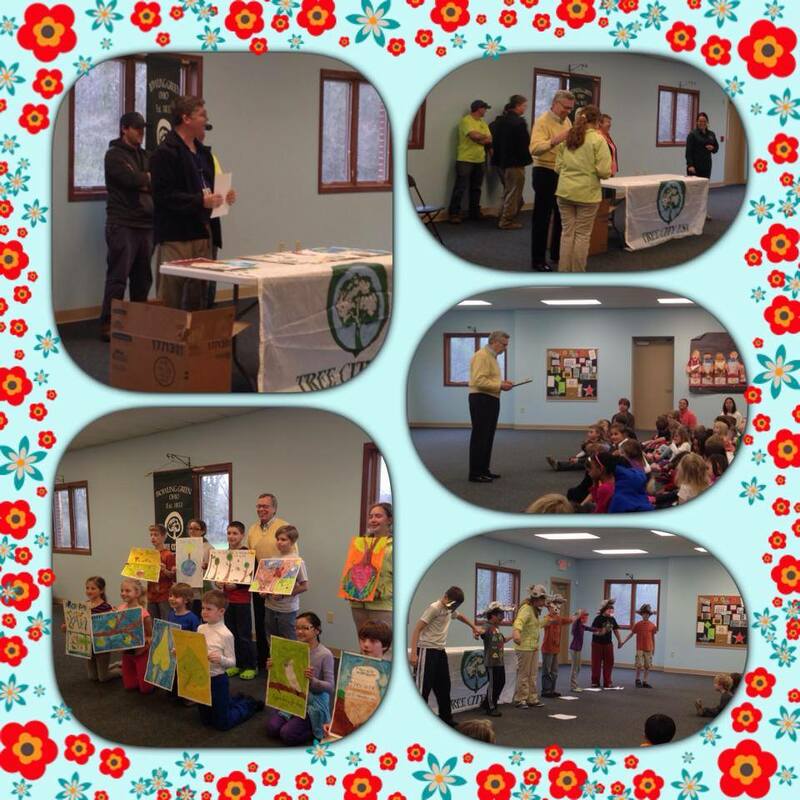 Thanks to Mayor Edwards, the BG Tree Commission, and our upper elementary students for the great Arbor Day assembly last week. Last weekend was busy, beautiful and fun! Click HERE for Earth Day pictures and HERE for Art Walk pictures. Thanks to all who helped and supported these great community events! And special thanks to Sue Clanton from the Bowling Green Community Development Foundation for taking the pictures! MSBG Middle School Sponsored Event designed for our 3rd grade-7th grade students. Olympic gold medalists Scott Hamilton and Sarah Hughes will join 12 National, World and Olympic figure skaters at the BGSU Ice Arena on May 3, as guest emcees in this year’s Skate for Hope Awareness and Research Fundraising Show. The show will also include local skaters of all ages (including some MSBG students and alumni) who raise funds for cancer research to earn their spots in the cast. BGSU is organizing the 3rd Annual Falcon 5 Miler & Lil’ Falcon Half-Miler. Click HERE for more information. May 19, 21, 23 BGSU is hosting hearing screenings and speech/language screenings. Click HERE for more information. Leadership BG is organizing a Spring Fling 5K. Click HERE for more information. Summer Camp schedule is out! Click HERE for more information. The Studio Connection has a variety of music lessons and classes available. Click HERE for more information. Click HERE for Summer Music Programs! 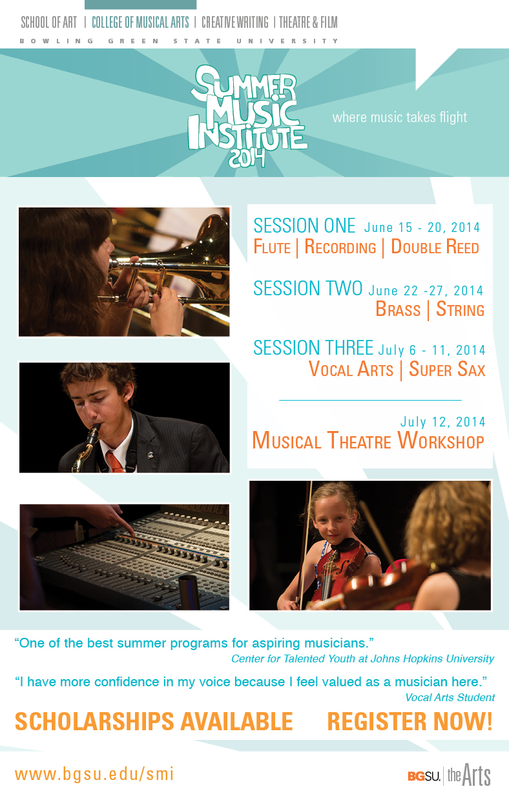 BGSU Summer Music Institute 2014 Program. Click HERE for more information. The Herringtons are moving to Minnesota this summer. :( They are having a 'goodbye' party. Click HERE for the info. and make sure that MSBG is selected as your non-profit of choice.